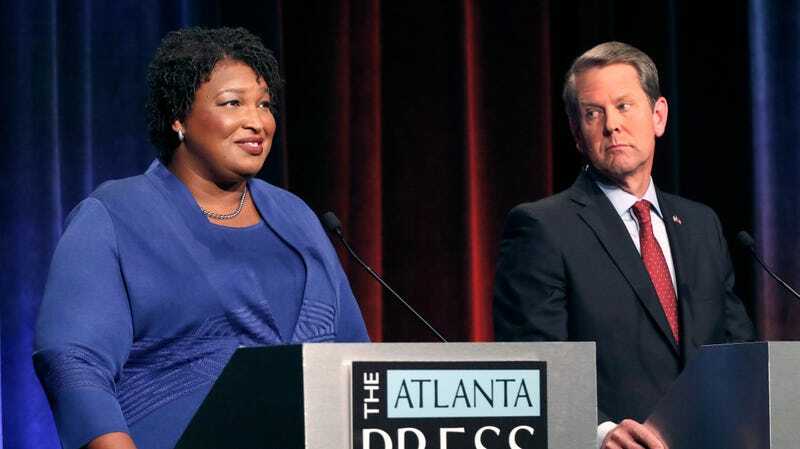 Democratic nominee for governor of Georgia Stacey Abrams, left, and Republican nominee Brian Kemp, right. Georgia Secretary of State and increasingly desperate Republican gubernatorial candidate Brian Kemp, who is tied in the polls with Democratic nominee Stacey Abrams, has shamelessly used his position as the state’s top election monitor to purge hundreds of thousands of voters from the rolls and close hundreds of polling sites over the past few years. On Sunday, he announced that his office is investigating a “failed attempt to hack the state’s voter registration system,” and named the Georgia Democratic Party as a suspect in “possible cyber crimes,” though Kemp did not clarify what those crimes were or pretty much anything else. Kemp and his office, however, have a well-documented history of either not understanding how computer systems that handle large amounts of data work or deliberately misleading people on the subject. In 2016, he accused the Department of Homeland Security of an “unsuccessful attempt to penetrate the Georgia Secretary of State’s firewall.” It later emerged that the alleged attack was routine traffic from a federal employee checking the state firearms license database as part of a background examination of private security guards at a federal facility, and the DHS concluded it would have been impossible to launch an attack from the DHS IP addresses involved. A computer scientist and an attorney suing Kemp said his office’s accusation of hacking is a distraction from a report that voter information is vulnerable on the state’s registration website. The Secretary of State’s Office said the system remains secure and voter information wasn’t breached. The vulnerability could allow someone to access voters’ registration and personal information, said Richard DeMillo, a computer scientist at Georgia Tech. “The way the website is set up, once you get access to your own voter record, you can go in and change permissions and get access to anyone’s voting record,” DeMillo said. According to a report on WhoWhatWhy—a small investigative site run by journalist Russ Baker—what may be happening is that security experts alerted Kemp’s office to major vulnerabilities in election databases, whereupon Kemp promptly used that as an excuse to blame the whistleblowers. (Baker’s work has been characterized as aggressively anti-establishment, and he has questioned the official narrative on JFK’s assassination.) However, WhoWhatWhy wrote that several security experts it had contacted had verified the vulnerabilities by examining the site’s code and without actually accessing or altering protected data, and that the Georgia Democratic Party “had already contacted computer security experts and notified them of the vulnerability” by the time of the “cyber crimes” announcement. What Kemp’s office is doing is disingenuous, Bruce Brown, lawyer for the nonprofit Coalition for Good Governance asserted. Brown noted that at 7:03 pm last night, he had emailed John Salter and Roy Barnes, former Governor of Georgia, in their capacities as counsel to Secretary of State Kemp, to notify them of the serious potential cyber vulnerability in the registrations files that had been discovered without any hacking at all. Brown also told Kemp’s lawyers that the information had already been forwarded to national intelligence officials. In the meantime, Democratic officials are issuing blanket denials that any hacking attempt occurred and characterized Kemp’s announcement as a last-minute dirty trick. As CNN noted, Georgia is “one of only a handful of states” that use voting machines with no paper records during elections. The Journal-Constitution noted that a recent poll found 49 percent of voters are concerned that it is likely or very likely that many people will be told they are not eligible to vote on election day. Updated: 11/8/2018: This story has been updated to more accurately qualify the work of WhoWhatWhy.